In Heian era, how did the aristrats have fun in their life without movies, televisions or radios? What is called "Kyoku-sui-no-en" was one of the way for having fun. "Kyoku" means twisting or twisted, " sui" means water or a stream, and "en" means an event or something like a party. 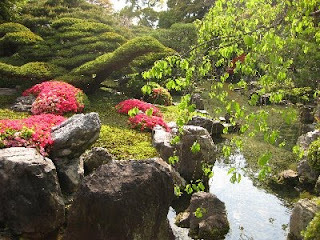 They sat by the side of a twisted tiny stream, making poems and sipping sake. A glorious spring weather makes us pleasant. However, in the days of old, it also brought the epidemic of bad diseases. So the people bathed in the river and prayed for their safety. 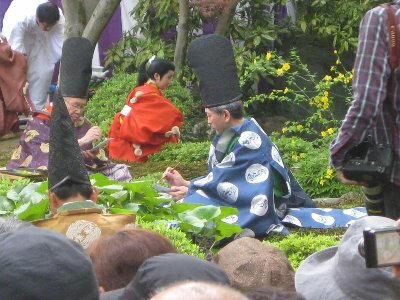 This is the origin of "Kyokusui-no-en" Later, the Emperor invited his people and the aristcrats having an event by the riverside. 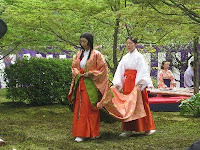 At first, a dancer called Shirabyoshi demostrated her beutiful dance to the invited. And then, boys carried small floats with a small cup of sake on, and they put them on the water. The floats slowly flowed on the water. The poets saw the floats going on the stream, and piked one on the float and sipped it after making a poem and writing it on a strip of paper. The cards written a poem were gathered and the poems were announced with specific tones by the announcers. I fully enjoyed the scene thinking of the old days and the people enjoying this event. This event is held in Spring and Autumn. 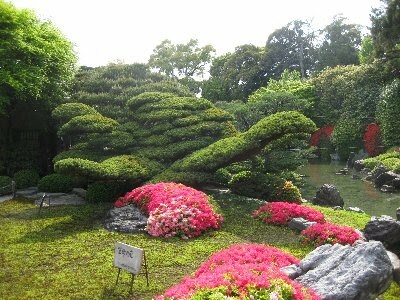 After the event, we walked in the garden of this shrine. One thing good is that we can see the garden for free of charge because of the event. How lucky !